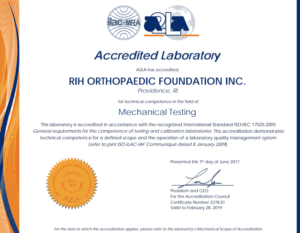 As an A2LA ISO/IEC 17025:2005 accredited mechanical testing laboratory, the RIH Orthopaedic Foundation Test Facility is equipped to utilize scientifically-rigorous methodologies and provide clients with accurate and repeatable data. Having assisted more than 100 companies with FDA submissions for over 500 medical devices, our team has the knowledge and expertise to assist at every stage of the product development lifecycle. 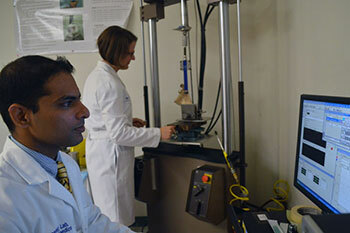 From the facilitation of early-stage proof of concept and feasibility studies to the development of detailed test programs and reliable test reports, our team can help. We assist companies with complete planning of their test programs so that all FDA, EU Medical Device Directive, and other regulatory requirements will be addressed. Our active membership in standards organizations such as ASTM International gives us timely insight into the regulatory environment. We also help venture capital firms and medical device companies perform technical file due diligence in evaluating their potential investments and acquisitions. We can provide the laboratory space for an in vitro clinical or engineering evaluation, review the technical file for the potential product, or review a company’s entire test program.